Lawrence is making schools a community hub where parents get help for their children and financial and employment guidance for themselves. On a recent Sunday afternoon, downtown Lawrence, Mass., became a ciclovia, Spanish for cycleway. Orange traffic cones kept cars off eight blocks around City Hall, as kids on bikes, teens on scooters and mothers pushing strollers made loops around Essex and Common Streets. This city of 78,000 embodies the notion that from pain comes power. Rewind to 2012. The state had just taken over the city’s chronically low-performing public schools, where only about half the high school seniors graduated. Boston magazine parachuted into Lawrence to discover problems that the community knew all too well: a high crime rate, a drug problem and overwhelming poverty. The ensuing piece, titled “The City of the Damned,” painted a simplistic picture of this complex community. The residents of Lawrence knew that the turnaround had already begun years—really decades—earlier, something missed in the reporting of the article. 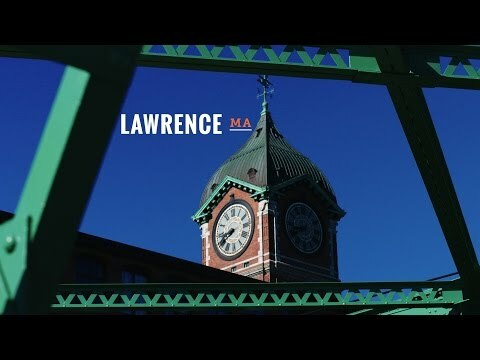 Not content to let someone else write their story, the community rallied under the banner, “We are Lawrence.” With that, they began to rewrite the script on what Lawrence was all about, and what it could become. Community groups stepped out of their silos of self-interest to collaborate even further on the shared goal of making Lawrence a healthier city. A spirit of resiliency, built on a legacy of activism stretching back a century, spurred neighbors on. Wendy Barr is a family physician who trained in Lawrence. After working in New York City, she returned to become assistant director of the medical residency program at the Greater Lawrence Family Health Center. Parent ambassador Elenita Belem explains the services provided by the Family Resource Center to an attendee at Lawrence's annual National Night Out gathering in O'Connell South Common Park in Lawrence, Mass. Long a gateway community for immigrants, Lawrence has the largest Latino population in New England, with 74 percent of the city’s residents coming from the Caribbean or Central America. Residents face formidable health issues, including high rates of asthma, heart disease, tobacco-related illness and diabetes. About 45 percent of children and 69 percent of adults are obese or overweight. Thirty-nine percent of children live in poverty. Leaders in Lawrence recognize that it will take a concerted effort on multiple, overlapping fronts to see improvement. “There's really a renaissance on how we build a community around this idea of a healthy place to live,” says Mayor Daniel Rivera, who, with the Mayor’s Health Task Force and the Board of Health, launched the Healthy Active Living Resolution and companion wellness campaign in 2014 to support active lifestyles. It’s a challenge that means addressing the struggles of working families. It’s turning around schools and investing in youth. It’s revitalizing vacant land and derelict mills. It’s adding more open space, community gardens and bikeways. It’s seeing how everything is connected. Lawrence community leader Vilma Lora conducts the Ciclovia raffle, in which the town gifted people with helmets and bikes. Volunteers uproot potatoes at Costello Urban Farm in Lawrence, Mass. Twenty-five miles north of Boston, Lawrence grew up around the textile trade. Nineteenth-century industrial tycoons built brick mills on both sides of the Merrimack River, harnessing the power of the waterway to create a wool-making capital. From anywhere in the mill district, workers could see the 260-foot-tall Ayer Mill Clock Tower in the heart of the city and know whether they were late for their shifts. Residents draw great pride from Lawrence’s history of labor activism. In 1912, workers by the tens of thousands walked off their jobs after mill owners cut wages. The “Bread and Roses” strike—named for a popular labor movement slogan at the time—dragged on for 63 days and ended with improved workplace safety, higher pay and additional worker benefits. The mills began closing after World War II, leaving the city haunted to this day with vacant buildings. Developers are gradually beginning to convert abandoned brick structures into apartments and offices. The city, too, has made it a priority to transform industrial wasteland into open space and parks. A blighted mill on the Merrimack River has been gutted and rehabilitated into Union Crossing, offering affordable housing for 60 families. It’s one of nearly half a dozen mill conversions adapting historic structures for modern uses. An unused section of a city playground is now the Costello Urban Farm, where 50 high school students work part-time raising vegetables to sell to neighbors who otherwise have little access to fresh produce. As the culmination of nearly 20 city park projects undertaken, the historic Campagnone Common has been upgraded with better lighting, a new playground, better walkways and new game tables for dominos. What was before a 3-mile stretch of trash-strewn riverfront is now a greenway along the Spicket River for runners, cyclists, and families walking to school and work. A forgotten one-mile stretch of a defunct railroad is slated to transform into a walking and cycling trail. A two-story, manmade hill is the centerpiece of the new Ferrous Urban Wild Park. The Ferrous Park at the confluence of the Merrimack and Spicket Rivers is a good example of this Cinderella story of urban transformation. Motorists used to drive past the vacant site and pay no notice to the towering, weed-covered mound in its the middle—a former foundry dumping ground. In 2015, with government funding, the nonprofit Groundwork Lawrence began clearing the site. Workers stripped away dense brush, added soil over the mound, planted trees and meadow flowers and built a circular path to the hill’s top. “It’s a model for regenerating brownfields,” says Lesly Medina, community engagement director for Groundwork Lawrence, which changes places—and lives—by improving the environment. The improvements include parks, greenways and urban farms. Medina calls the finished Ferrous Park “a natural balcony” for people to enjoy panoramic views of Lawrence and the Merrimack River. Children climb on the jungle gym in the new playground in Lawrence's Campagnone Common on a Sunday afternoon. Valerie De Los Santos, 6, climbs on the jungle gym in the new playground in Lawrence's Campagnone Common on a Sunday afternoon. Next door to the park is Union Crossing, a rejuvenated mill on the Merrimack that’s now a mixed-use housing and commercial site designed with community input. Just over five years ago, Lawrence CommunityWorks, the site’s nonprofit developer, surveyed hundreds of neighbors about the challenges they faced. Money worries were the top source of stress; not only was there a critical need for safe and affordable homes, but also for help with employment and finances. With support from the United Way, the nonprofit included a Financial Stability Center when it opened Union Crossing. The center offers residents help with employment, education and finances. More than 2,000 people have used its services since it opened in the summer of 2013. “The financial stability center is a one-stop shop where we work with families based on their aspirations and challenges,” Andors says. The model is also being used by the Lawrence School District, which last year opened a Family Resource Center to help the parents of students meet financial and employment goals. A resident doctor fluent in Spanish meets with a patient complaining of swelling around the ankles at the Greater Lawrence Family Health Center in Lawrence, Mass. Dominga Flete plays dominos with friends on the tables which have been recently installed at Campagnone Common in Lawrence, Mass. As the city and community groups mobilized to address the economic, environmental and social factors that influence health, they found a strong partner in the Greater Lawrence Family Health Center. People in Lawrence speak of their community health center with the same degree of civic pride as when they recall the defining Bread and Roses strike of 1912. They view it not just as a place for a doctor’s visit or an X-ray, but as emblematic of the city’s resiliency. Started in 1980, the federally qualified health center had a difficult time recruiting and retaining primary care physicians for its mostly immigrant patients with limited English proficiency and a high prevalence of chronic disease. Doctors who were assigned to the center through the National Health Service Corps usually left Lawrence once they fulfilled their commitments. In 1994, the health center made the strategic decision to train its own primary care physicians by starting a residency program, the first of its kind in the nation for a federally funded clinic. “The decision was made to grow our own, so to speak,” says Joseph W. Gravel Jr., chief medical officer of the health center and residency program director. The family medicine program, which extends for four years instead of the usual three, emphasizes building ties in the community from the first day of training. Each doctor is paired with a local organization and given time to work on health issues. It could be holding a group meeting on managing diabetes or working with the YWCA to increase mammogram visits for Hispanic women. Residents also staff health centers at two high schools and are given work time for other forms of community service, such as cleaning up a river near the clinic or mentoring students. The curriculum also sets aside time for doctors to become proficient in Spanish, says Gravel, because bridging the language gap makes doctors more effective and better listeners. Of more than 150 program graduates, at least 30 have stayed in Lawrence. The city that could not attract enough doctors 20 years ago is now inundated with 800 applicants a year for eight spots in the family medicine residency. Barr, the assistant residency director, says the health center’s unique approach of embedding doctors in the community means physicians are not just learning about the social and economic determinants of health in the abstract—they are witnessing them firsthand. This approach and way of thinking—born of innovation, led by people, fed by ongoing efforts—is indeed changing lives in Lawrence, day in and day out. Learn how to help students by helping their parents from 2015 RWJF Culture of Health Prize winner Lawrence, Mass.